Volume 13 of Reviews in Mineralogy presented much of our present-day knowledge of micas. 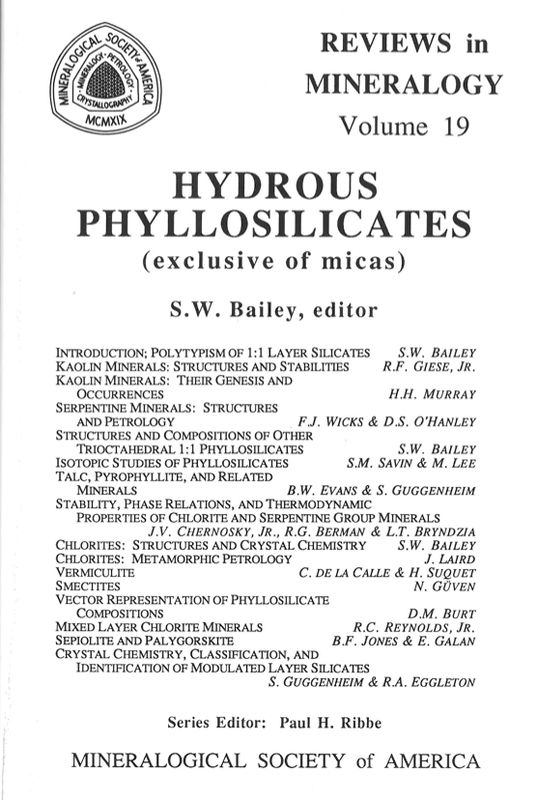 At the time of that volume (1984), I mentioned that there was too much material available to attempt to cover all of the hydrous phyllosilicates in one volume. The micas were treated first because of their abundance in nature and the fact that more detailed studies had been carried out on them than on the rest of the phyllosilicates. The serpentines, kaolins, smectites, chlorites, etc. would have to wait their turn. Now, four years later, that tum has come. Hence the peculiar nature of the title of this volume. We know less about the rest of the phyllosilicates than we do about the micas, primarily because many of them are of finer grain sizes and lower crystallinities than most of the micas. As a result, we have been unable to determine as much detail regarding their structures, crystal chemistries, and origins. Nevertheless, there is a considerable body of literature about them, and this volume will attempt to collate and evaluate that literature. One compensating factor that has helped greatly in the accumulation of knowledge about these minerals is that some of them occur in large deposits that are of great economic value and thus stimulate interest. For this reason considerable emphasis in this volume will be related to the occurrence, origin, and petrology of the minerals. The authors of this volume presented a short course by the same title to about 120 participants in Denver, Colorado, October 29-30,1988, just prior to the 100th anniversary meeting of the Geological Society of America. S. W. ("Bull") Bailey convened the course and edited this volume, his second for Reviews in Mineralogy. Because he is retiring at the end of this academic year after 38 years' teaching at the University of Wisconsin (Madison), his colleagues, friends and I (a diligent student of "Bull" thirty years ago) agreed that it would be appropriate to dedicate this volume to him, odd though it seems to have him editing a book honoring himself. He had no advance knowledge of this dedication.